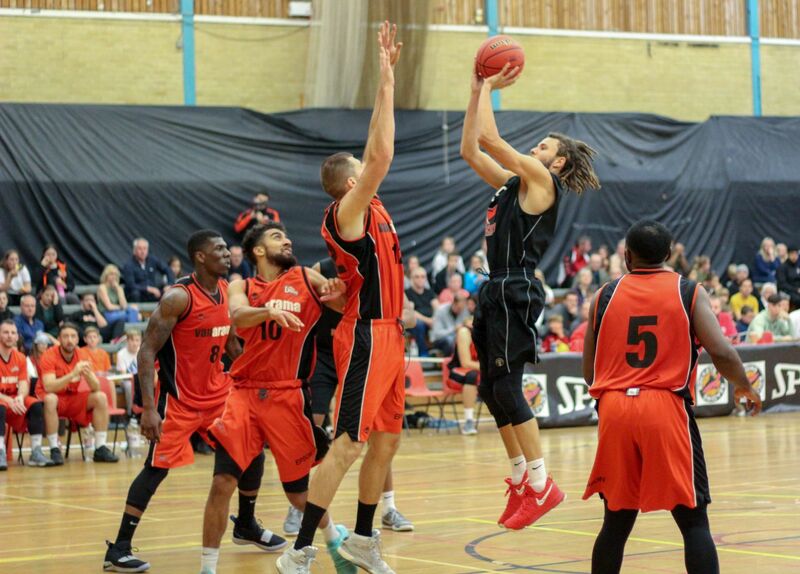 In what would undoubtedly be Rockets’ hardest encounter of the season to date away to the unbeaten league leaders, Rockets led at the end of the first quarter, were level at half time and within 2 scores with just under 3 minutes to go but the strength in depth of Kestrels told in the very last moments as Solent took another win to go 9-0 . Rockets’ only 2 defeats to date had been to the second and third teams in the league and with captain Danny Carter having to manage his back strain and Ronan O’Sullivan out with a broken hand for 2/3 weeks, Rockets showed their mettle from tip to buzzer. The competitiveness was shown early in the game as the scores were tied on 5 occasions during the opening exchanges. A J Carr again proved a handful for Kestrels as he stroked a treble to start his personal tally which was 11 points in the opening period which Rockets took 20-18. Carter was introduced to the game early in the second quarter and he spun to score and Adrian O’Sullivan kept the offences flowing though Rockets missed many scoring opportunities. 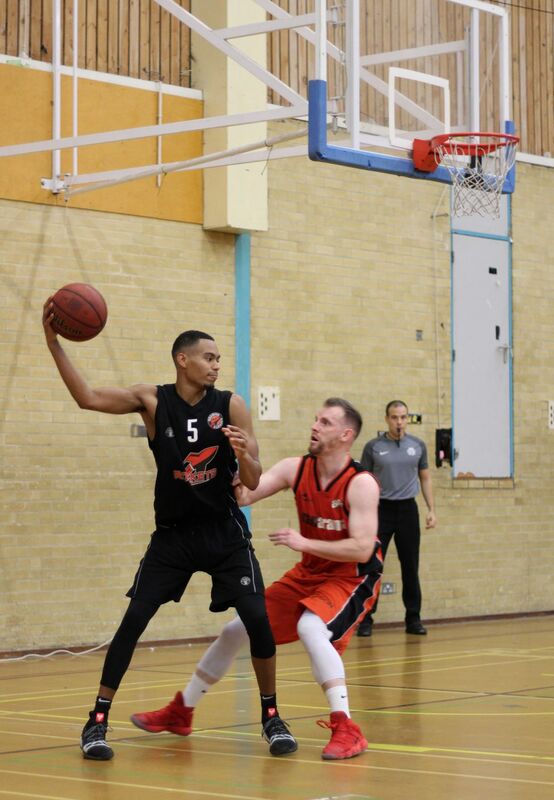 Carr was strong inside and Academy youngster David Obediah worked hard on the offensive boards to score and see Rockets 29-20 ahead causing Solent to call a time out at 6. 22 to go in the second period. Kestrels responded with a 14-2 run to edge ahead 34-31. An O’Sullivan steal and score quickly followed by one from two from the free throw line again saw the teams level on 38 points each at the interval. Rockets began the third period with a wayward pass from which Solent made a three point play. 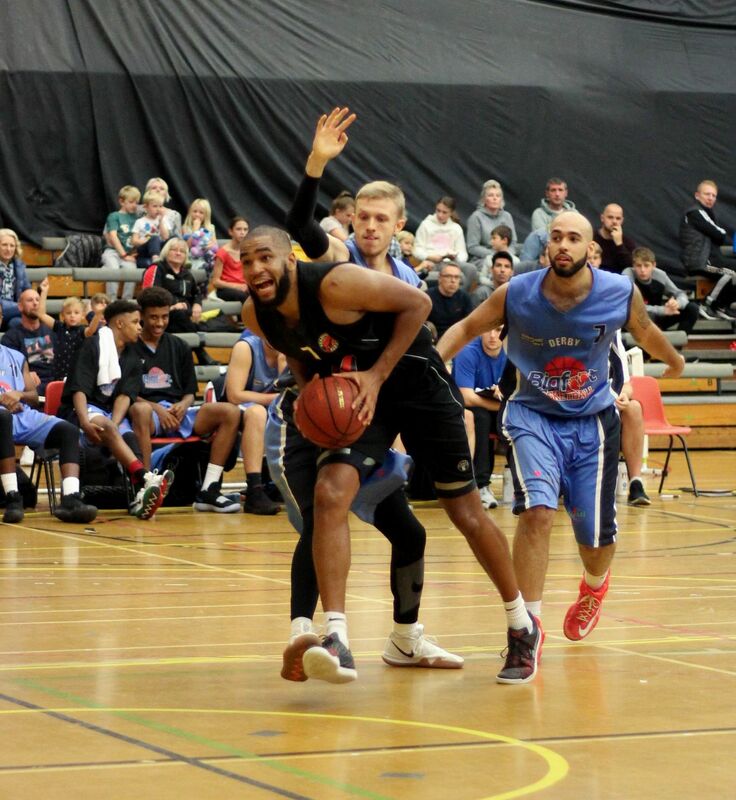 O’Sullivan scored off an offensive rebound but Solent opened up an 8 point lead at 50-42 as Trae Pemberton was called for his third and fourth fouls which saw him rested at a critical time in the game. Carr continued to strive around both baskets but a brace of trebles from Solent saw Kestrels have a double digit advantage at 62-52 at the end of the third quarter. Sydney Donaldson took a charge and stroked three trebles to ignite Rockets. With Pemberton now released to play the last 5 minutes, he showed what Rockets had missed with this time on the bench as he stroked a pair of trebles to bring the score 70-75 with 2 minutes 50 secs left. Excellent floor hustle form Donaldson gave Rockets possession but they didn’t capitalise on it to get even closer to Kestrels who responded with a treble to ease to an 8 point lead with a couple of minutes remaining. Carter, Pemberton and O’Sullivan scored but Rockets just couldn’t get any closer as they slipped to their 3rd league loss…each one against the top three sides. Clearly the second half of the season has much to offer for Head Coach Alan Keane though he quickly moved his thoughts to the following day’s away National Trophy game where a win would see Rockets in the semi-finals. Top scorers for Rockets were A J Carr with 23 points and 12 rebounds, Sydney Donaldson with 17 points, 8 rebounds and 9 assists and Trae Pemberton with 16 points.